When you enjoy summer on Lake Nantahala, you get the best of all worlds: crisp green foliage, beautiful mountain paths, and the clear, sandy shores surrounding Lake Nantahala. Our crystal clear water means kids can learn about our bountiful fish and aquatic plants as they swim. Swimming is a cornerstone of summer memories. If your child, niece or nephew, or grandchild isn’t comfortable in the water, follow these tips to teach kids to swim in Lake Nantahala. Before you begin teaching a child to swim, check the surrounding area for fishermen, wildlife, and proximity to the docks. Always supervise a beginner swimmer at all times. Resist the temptation to outfit your child in a life vest as he or she learns. Once a kid learns to swim in a life vest, it’s difficult to teach them to swim on their own. If additional flotation is necessary, let your child explore our North Carolina shores wearing a progressive floating trainer. 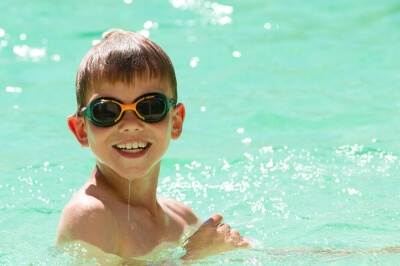 Grab noodles, kickboards, and inner tubes to help kids learn different swimming skills. A child’s age determines which swimming techniques he or she can master. For toddlers and preschoolers, teach breathing techniques as you acclimate them to the water. Children aged 4 and up can learn basic kicking and swimming skills. Kids will learn the best swimming techniques at a North Carolina outdoor center class with a registered swim instructor; however, parents can teach kids basic swimming skills and water safety. Make swimming fun by swimming and playing water games while the kids learn. Never abandon a new swimmer to solitary swimming, even if a child is making great progress. Before teaching a kid the backstroke, the breaskstroke, the butterfly, or any other swimming technique, refresh yourself by reading a step-by-step tutorial online. Make the most of your Lake Nantahala lake house by teaching young friends and family members to swim. 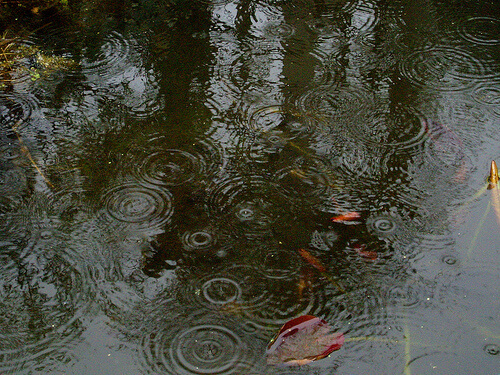 Don’t let the rain get you down. With care for precautions, you can still enjoy a great day of swimming in Nantahala. With the added water from the consistent rain we’ve been getting in the area, the rapids of the Nantahala River and the power of the streams in the area has steadily grown, making the water somewhat risky for visitors. 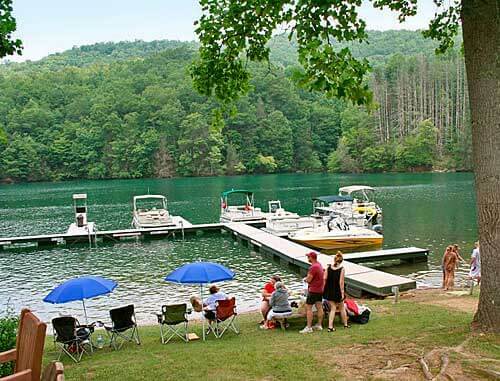 If you’ve planned to visit your lake house in the coming weeks or have planned a vacation to Nantahala, don’t worry; you don’t have to miss out on all water sports. To avoid the strong stream flows and to have a safer swim, Nantahala Lake provides a calmer, more serene retreat until the water recedes. The large lake can handle added water capacity well, keeping the waters calm and clear, perfect for swimmers, fishing, kayaking, boating, and other water sports. 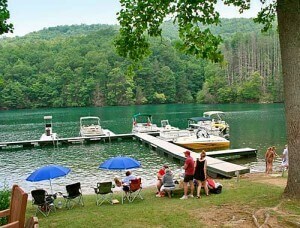 We hope that everyone continues to have a safe and amazing fun summer in the Nantahala area, especially at the lake! A little vigilance and safety can go a long way towards having a great day at the lake, even after all of the rain.